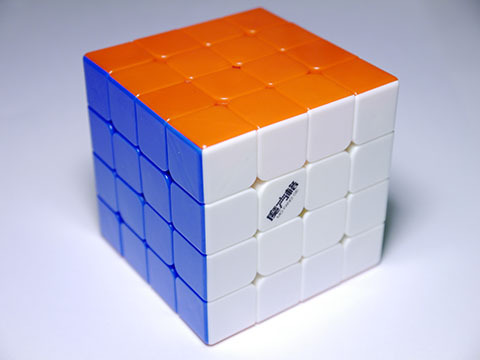 In our new wave of big cubes, we finally get a new 4x4! This is the QiYi WuQue, the first 4x4 from one of the big players we've seen in a while and the one touted to be the AoSu killer. Can it accomplish its steep charge? 4x4x4 hardware has stagnated for a while. The MoYu AoSu was released in January of 2014 at a rather steep price, and yet, up until now there has been no 4x4x4 that could decisively be declared to be better than the AoSu. 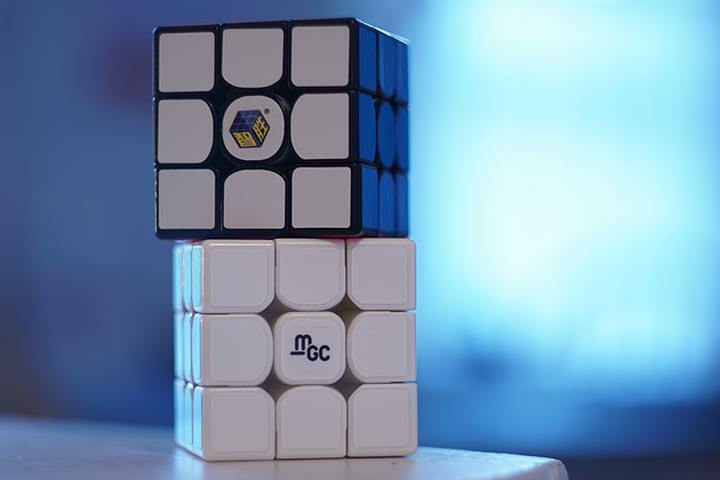 Sure, many have come close - the GuanSu took us all by surprise because of how good it was given its cheap price, and the YuXin Blue took over as many people's mains because of its size and feel. Yet the general consensus was that the AoSu is still the best 4x4x4, even if it is losing its lead. 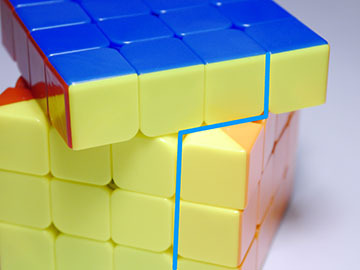 The QiYi WuQue is the cube that hopes to advance the 4x4 market past the AoSu. Touted by both QiYi and by the community to finally overtake the AoSu, the WuQue is already receiving tremendously positive feedback from the testers who have their hands on it. 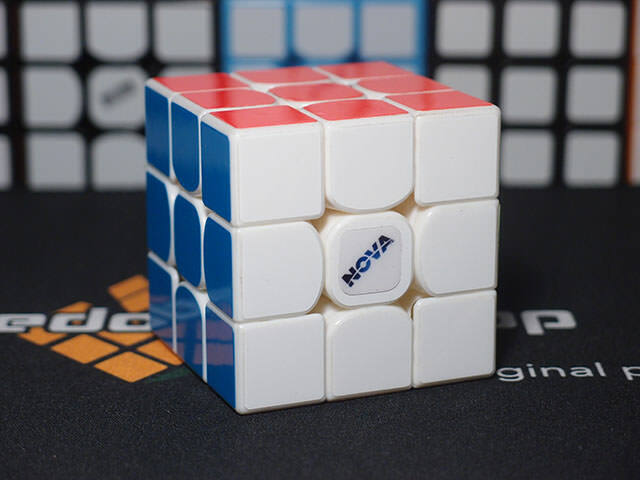 Even Feliks Zemdegs, a cuber not known for switching cubes lightly, has switched to a WuQue and said it to be better than the AoSu. Might this be the push we've all been waiting for? 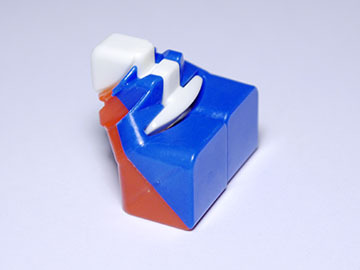 This cube feels quite unique, though it may just be because I'm used to cubes like the AoSu and YuXin Blue. Each face is very flat and flush, and the inside edges of the cubies seem much sharper rather than rounded and bubblier like the AoSu. 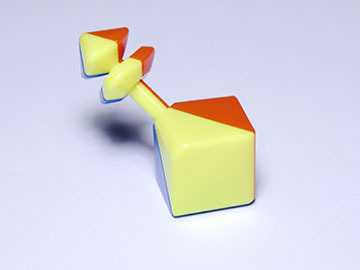 It almost seems like QiYi took inspiration from very flat cubes like the YueXiao. I adore the way the YueXiao looks, and like this feel just as much - in a way, it feels more modern. No complaint from me here. In the hand, it actually feels just a bit flimsier than the AoSu, partially because the corners are slightly loose and rattle around, and partially because it weighs 124 grams stickered, a full 20 grams less than the AoSu. That being said, you won't get the feeling that it's going to fall apart anytime soon. It measures the standard 62mm, which is a bit unfortunate for me - I've really taken to the 60mm size. The stickerless shades are the same bright, attractive shades that the Valk 3 uses, and knowing that I expect the stickered shades to be the Valk 3 stickered shades as well. Spoilers: the cube already felt amazing out of the box, and was tuned and tensioned well. I just loosened each screw a quarter turn and left it at that. This cube has actually gotten me back into practicing 4x4. In the short time I've had it, I've already put about 240 solves into it and don't intend on stopping. To me, all modern 4x4x4s have felt roughly the same. They might have subtle differences, but in the end they're all mostly scratchy and bumpy especially on the inner layers, partially because of that alignment mechanism that's so difficult to get right. The WuQue is the first 4x4x4 I can say actually feels different. The outer layers have a wonderful MeiYing-like rolling smoothness, as if they were riding on non clicky ball bearings. The inner layers have a silky, swishy smoothness, just like the inner layers of the WuShuang. It feels very different from every other 4x4x4 out there. Out of the box, it's mildly faster than the AoSu. The outer layers and the inner layers about the same speed, but I think this is justified since 4x4x4 is much easier to control than 5x5. All of the layers are very stable but still turn well, and even during high TPS the turning is very smooth and flowy. Really, it feels just like a WuShuang. That's quite a compliment, given how good the WuShuang feels and the fact that it's generally easier to make a good 5x5x5 than a good 4x4x4. On my tensions the WuQue manages around 44 degrees of forward cutting on the outer layers. It's just short of lining up the middle of the dedge with the seam in the edge piece, which is 45 degrees. That's far more than any of my AoSus have ever been able to do. Reverse cutting is equally impressive. It does a little more than half a cubie, where the AoSu only manages about a quarter of a cubie. What's more, reverse cutting feels smooth and snappy, unlike the AoSu or other 4x4x4s where reverse cutting usually feels catchy and generally just awful. Corner cutting between other layers reaches around one cubie, some layers a bit more, some a bit less. 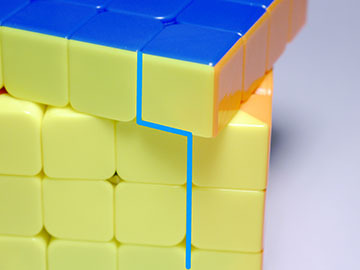 Reverse cutting extends to approximately a third of a cubie on these other layers. These are excellent results for a 4x4 and the best I've seen in any NxNxN besides 2x2x2 and 3x3x3. Full marks. Nah. 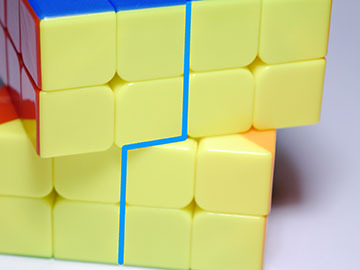 4x4 is low enough of an order that trying to corner cut farther than possible (which is quite difficult with this cube, given how good corner cutting is) will just result in a minor catch. I haven't experienced a single pop or serious lockup on this cube, and I haven't experienced one on the AoSu either. 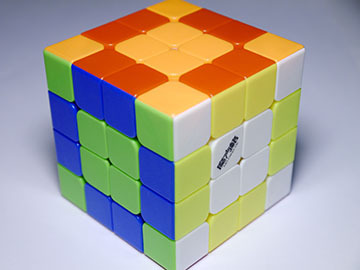 Modern 4x4x4s are actually reduced 5x5x5s, meaning they have a 5x5x5 mech but the innermost slices are recessed and the other layers are reshaped to make it proportional. (There's also the complex matter of the alignment mechanism, but that's beyond the scope of this review.) 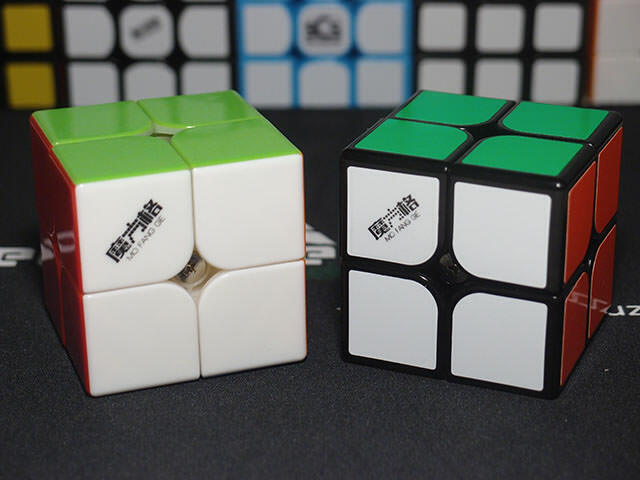 Seeing as QiYi just released the WuShuang 5x5x5 not long ago, and this 4x4x4 happens to feel very similar to it, I wonder. Could this be a reduced WuShuang? On first glance, it does not appear to be so. 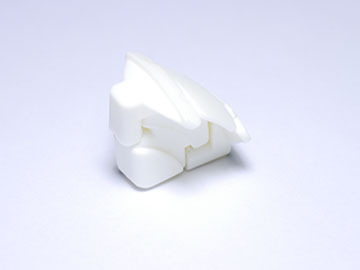 It looks just like any other 4x4, with a white ball-shaped internal structure and pieces that seem to wrap around it. A single dedge. You actually do start to see quite a bit of similarity here - the outer edges look almost identical to WuShuang outer edges, and the internal edge has the same general structure as the WuShuang center edge. However, all of the shapes are a bit simplified and cleaned up in the WuQue, and the torpedo of the WuShuang center edge is removed. A single corner. 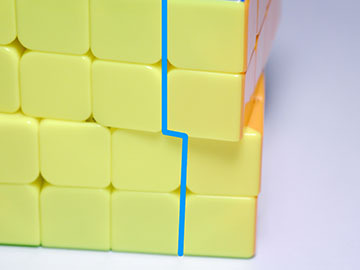 It inherits the two-layer corner foot design of the WuShuang corner, but loses the small bump between the two layers. Indeed, when you look into the geometry, the WuQue does start to resemble the WuShuang quite a lot. As opposed to the AoSu's bubbly and relatively loose fitting internal pieces, here we can see that the three internal pieces are all rather angular and fit very snug with each other. Another trait it inherits from the WuShuang. The internal structure overall seems to be based quite heavily on the WuShuang's, with many similar features and geometry. It's just simplified a bit and loses some of the more 5x5x5 specific features, such as torpedoes. This accounts for why it feels so similar to a WuShuang. Easily the best 4x4x4 to date. 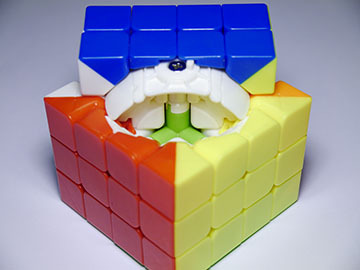 All layers are smooth and flowy, and the cube is very stable and still retains speed. It doesn't pop or lock up, and corner cutting is the best corner cutting in a 4x4x4 we've seen so far. Ahh, finally another cube with full marks on both. The last cube to do that was the Valk 3, and we all know how good that cube was. QiYi's done something quite impressive with this cube. They've managed to give the 4x4x4 hardware market its first push forward since 2014, and managed to overtake the 3 year-old reigning king, the AoSu. This cube is the best 4x4x4 ever made. I haven't even mentioned price yet. 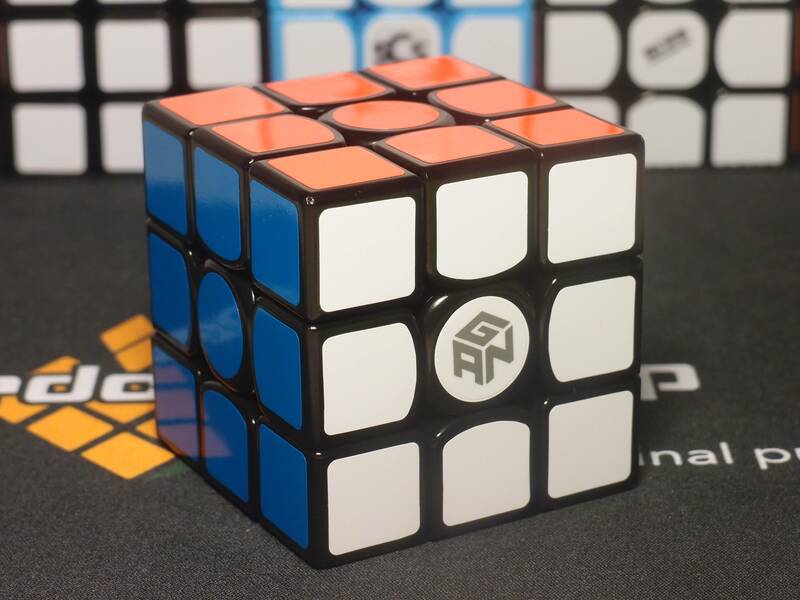 This cube sells for $21.95, which is granted significantly more than cubes such as the CangFeng or GuanSu, but is actually $5 cheaper than the AoSu. That means the AoSu is going to have quite a difficult spot on the market from now on. MoYu's about to swing back with full force. They've already announced the BoSu, due to release very soon. It will be very interesting to see which one comes out on top.